I'm back. And even on schedule! Will wonders never cease? Apologies for leaving you in the lurch on Friday, but as I warned you might happen last Wednesday, the combination of certain events conspired against me and I wasn't able to get anything together (at least nothing worth reading anyway) in time to be posted. Hopefully you managed without me. As it was, I had a brilliant weekend that included attending a couple of winning ballgames as well as some quality time with my nephew. Hard to complain about that. So as we begin another week, what's the best way to get caught up? A “Notes” column, of course! Though Mr. James was speaking mostly of long-form fiction writing, I think it's a fair statement to make even of amateurish blog writing. As long as it's able to hold your interest, any other errors are rather excusable... I hope. 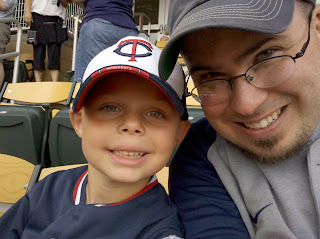 The Twins took three of four from the White Sox over the weekend... and I was lucky enough to be present for two of them. Since I didn't get you a DFTU column on Friday, consider this a brief catch-up segment. The Twins dropped their first post-All Star break game on Thursday to the White Sox, and it seemed fans were going to have to live with more of the same dreck they'd been watching before the break. Once again, a Twins starting pitcher got lit up. Once again, the boys made a furious comeback. And once again, the bullpen wasn't able to make the comeback stick. Then a funny thing happened. The Twins started to get some starting pitching! Friday night (with yours truly in attendance), Francisco Liriano pitched a seven and two-thirds inning gem. Frankie struck out eight, walked only two and gave up just two earned runs on the way to earning his seventh win on the season. The game was sullied a bit by John Rauch's win-endangering meltdown in the ninth. Fortunately, the boys had given him plenty of cushion, and Jessie Crain was able to pick the big man up, notching his first save of the 2010 season. Saturday (again with yours truly in attendance), it got even better. Carl Pavano out-dueled Mark Buehrle on the way to a 3-2 complete-game victory. Now this was a baseball game. Neither team committed an error (a rarity for the White Sox these days). Neither team had to use their bullpen. And the game wrapped up in a neat and tidy one hour and fifty-two minutes. There was excitement, there was drama, and - of course - the right team won. Amazing what happens when the pitching staff does their job, isn't it? Heck, after two stellar starts like that, the boys were so encouraged that when Nick Blackburn melted-down again on Sunday (and though it pains me slightly to say it, probably for the last time for the foreseeable future) they still managed a furious comeback in the bottom of the ninth. The Twins scored four runs in the bottom half of the final frame, ending the game on a Delmon Young single and - appropriately for this series - a White Sox error. Pitching and defense are the name of the game folks. When the Twins get them, they're as good as - if not better than - any team in the division. When they don't? Well, we all saw what happened heading into the break. Brian Duensing relieved Blackburn on Sunday, pitching four innings and earning the win. Four innings is a lot for a reliever... unless you're trying to stretch him out so he can take somebody's spot in the rotation. I'm not sayin'. I'm just sayin'. It's hard to top that. Thanks also to Lisa and Logan from Forest Lake, who joined the nephew and I for a fun game and an eventful (thank you mother nature - for letting us get the game in at least) drive home! The reach of Writing for the Cycle is growing... Part 1. Last Wednesday, I got an email from a random reader, Steve in Columbus, OH. Seems he was thinking much along the same lines as I was in this column when I opined that it was best that the Big Ten keep it's name, and change it's logo to accommodate the addition of Nebraska. In that column, I suggested that the Big Ten should scrap shadowing a number in it's logo, instead working in a “+” so that future expansion (which still seems likely) would be covered. As you can see that it's not a huge departure. That's actually a compliment to Steve. Consistency is a big part of brand marketing. 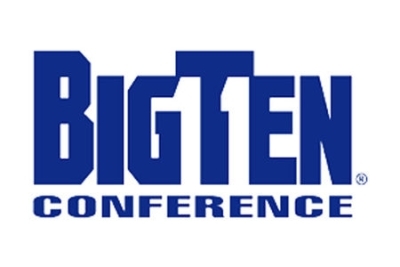 Since the idea of maintaining their current brand identity is what leads me to believe that the Big Ten won't change their name, consistency is important. So kudos to you, Steve in Columbus. Thanks for sharing your idea with myself and my readers. I hope the Big Ten notices and compensates you appropriately! The reach of Writing for the Cycle is growing... Part 2. Some of you will recall a few weeks ago when I wrote this column about my trip to Milwaukee to see the Twins take on the Brewers. Apparently, the fine folks in Milwaukee were paying attention! 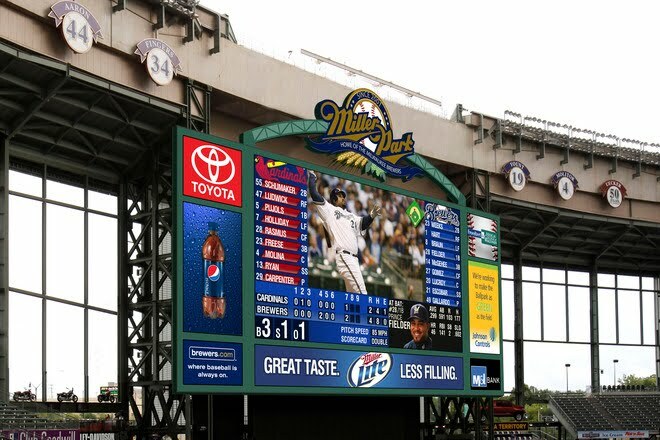 A little over a week ago, David in Milwaukee (one of the friendly duo I attended the game with) sent me this article from the Milwaukee Journal-Sentinel's website, discussing plans for a brand new scoreboard at Miller Park. 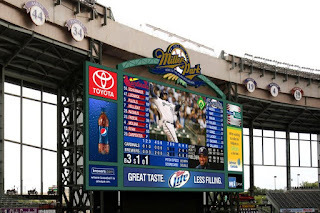 According to the article, the new scoreboard will become the third-largest in the big-leagues with only Kansas City and Arizona having larger boards. The new board's 5,940 square feet, barely edges out the board at Target Field, which measures 5,757 square feet. I guess I should be careful before offering criticism. Sometimes people listen, and my favorite team's park gets outdone! Hopefully the fine folks in Milwaukee won't feel the need to rub it in... are you listening Milwaukee? I hope so. Thanks to David in Milwaukee for passing along that link. That's going to wrap things up for today. I'm going to do my best to get back on the usual M/W/F schedule, and have something new for you on Wednesday. As usual, I say that with the following reminder: my plans are always subject to change! Until next time then, thanks for reading!